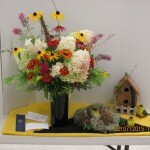 The seventh annual North Georgia Community Flower Show that took place August 3rd through 5th at the Haralson Memorial Civic Center in Blairsville was a huge success with over 160 people attending the show. 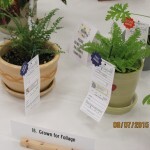 The show was organized by the Flower Show Committee comprised of Master Gardener Extension Volunteers, area Garden Club members, the Union and Towns counties Cooperative Extension Offices, the Union County Commissioner’s Office and volunteers from our community. This year’s show included 200 exhibits from residents of Union County and surrounding counties in several sections and divisions including cut specimens for flowers and trees and shrubs, container plants, hanging containers, native plants, bonsai, youth, education and design. Awesome describes it best, from Susan Jarocki’s Dahlia ‘Bashful’ bloom that won a first award in the cut specimen section to the bonsai section containing several of Rod Burley’s Bougainvillea that rivaled exhibits of larger shows. Dixie Confexions and Made by Mamz each donated beautiful, delicious cakes that were enjoyed by attendees and Flower Show volunteers. Although it was not a Standard Flower Show as sanctioned by National Garden Clubs, Inc., we were proud to have accredited flower show judges Virginia Palmer, Sharon Payne, Frances Dyer and Debra Nicholson and native plant expert Elaine Delcuze and design experts Virginia Fancher and Stephanie Gray critiquing our show for awards. Many proud participants took home first place awards. The Horticultural Excellence Award went to Tom Starrett for his Juniper procumbens ‘Nana’. The Designer’s Choice Award went to Sharon Payne for her floral design in Section C, Thanksgiving: Give thanks with a grateful heart. The Best In Show Award went to Jennifer Logan for her floral design in Section E, Happy Birthday; I’m not getting older, I’m getting better. The Youth Award went to Laura Mauldin for her 4th of July design entry. The Education Award went to Brian Fancher for his exhibit on Moss Gardening. Other First Place Blue Ribbon Awards went to Laura Mauldin – Phlox, Emily Rittenhouse – Zinnia elegans, Brian Fancher – Echinocactus grusonni, Gold Ball Cactus, Rod Burley – Adenium obesum, Desert Rose, Lynn Varian – Juniper communis, Susan Jarocki – Dhalia ‘Bashful’, Pat Smith – Rosa floribunda and Helianthus sylphiodes, Jo Anne Allen – Alocasia amazonica, African Mask, Sheleila O’Neal – Hexastylis ‘Little Brown Jug’, John Hendon- Lavender ‘Bridget Chloe’, Christine Issa – Plectranthus coleides, Sharon Payne – Halloween: Trick or Treat design, Stephanie Gray – Christmas: The Magic of Christmas design, Elizabeth Claypool – Easter: The greatest gift of Easter is Hope design. The North Georgia Community Flower Volunteers would like to thank the community and our sponsors and contributors that supported this effort. Emily Rittenhouse, Senior at Union County High School, won a first place blue ribbon for her Zinnia elegans at the North Georgia Community Flower Show that took place August 3rd through August 5th at the Haralson Memorial Civic Center in Blairsville. She also served as Flower Show intern where she assisted with show set-up, the registration process and various other tasks when needed. 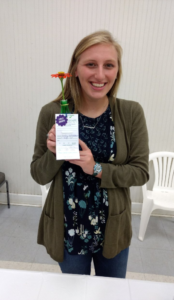 Currently Emily serves as Vice-President of the Senior 4H Club and recently she attended State Congress and placed 3rd in State in the category of Flowers, Shrubs and Lawns. She also participates on the 4H Archery Team and was a Team Leader at Rock Eagle 4H Camp. 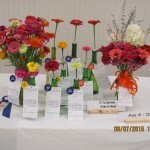 The annual Union County Community Flower Show held August 6th through August 8th was a huge success. The show was organized by the Union County Community Flower Show Committee and was attended by residents from Union and surrounding counties. This year’s show included 176 exhibits, an increase of 20% from our 2013 show of 147 exhibits, in four divisions including Youth, Design, Education and Horticulture. Although it was not a Standard Flower Show as sanctioned by National Garden Clubs, Inc., we were proud to have accredited flower show judges Virginia Palmer, Sharon Payne, Linda Ragland, and Edna McClellan and design expert Virginia Fancher and horticulture expert Ruth West critiquing our show for awards. Many proud participants took home first place awards. In the Youth Division, preschool – age 7, Sadie Church received the Youth Award for her Begoniaceae, Cane Type Begonia. Lily Brown in the Youth Division age 8 – 12 received the Youth Award for her Zinnia elegans and Emily Rittenhouse in the Youth Division age 13 – high school received the Youth Award for her Echinacea purpurea. 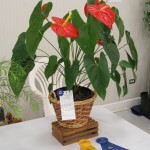 In the Horticulture Division, the Best in Show Award went to John W. Ludlum for his Anthurium “Andraeanum’. Horticulture Excellence Awards went to Tom Starrett for his Acer palmatum Bonsai Forest and Susan Patterson for her Eucomis liliacea ‘Sparkling Burgundy’ Pineapple Lily. Allan Driskell received the Award of Merit for his Dahlia ‘Holly Hill Black Beauty’ and the Special Award for his Dahila ‘Gloriosa’. Tom Allen received a First Place Award for his Larix decidua and Jo Anne Allen received a First Place Award for her Chamaecyparis pisifera ‘Mophead’. The Union County Community Flower Show would not have been possible without the contributions of our sponsors and donors: the Union County Commissioner’s Office, the Union County Extension Office, United Community Bank – Blairsville, Steve’s Steakhouse, The Cookie Jar, Cut Loose Beauty Salon, Blairsville Historic Diner aka Hole In The Wall Restaurant, Litton Landscaping, Sears Hometown Store – Blairsville, Tri-County Office Supply – Hayesville, Cook’s Country Kitchen, the Bagel Barn, local garden clubs and the Towns-Union Master Gardeners. The following donors have added greatly to the success of our show: Bi-Lo Grocery Stores – Blairsville, Blimpie’s – Blairsville, Nelson Ace Hardware & Garden Center – Blairsville, North Georgia News, Smokey Mountain Guide, Buds & Butterflies Nursery & Garden Center – Blairsville, Crooked Creek Farms Foxfire Blends, David & Kimberly Davenport, Berry’s Honey Farm – Blairsville, Joy Nywening, Stiches of Joy – Blairsville, Ingles – Blairsville, Allegheny Masonic Lodge #114 and Logan Turnpike Mill. After our Show, the cut flowers and foliage specimens were donated to Regency Hospice for them to share with their patients.